This post is only half about Neil Gaiman, I promise. We've had a day of exciting visits! First there was the reading/signing with authors Sonya Sones and Bennett Tramer, who were here to present their brand-new picture book, Violet and Winston. Their reading of the quirky friendship book (in the tradition of George and Martha, Houndsley and Catina, and Frog and Toad) was as warm and funny as the book itself. Then this year's three judges of the Boston Globe-Horn Book awards stopped in! Horn Book Guide editor Elissa Gershowitz, library media expert/author/critic Jonathan Hunt, and author/children's librarian Ruth Nadelman Lynn unfortunately wouldn't give us even a little hint about what books they're considering for the awards -- but they did suggest that we keep checking the Horn Book website for updates. Speaking of awards, Neil Gaiman's The Graveyard Book won not one, but two Audie Awards this weekend: for best Audio Book for Children 8-12, and for Audio Book of the Year! As an avid audio book listener (and, of course, a rabid Gaiman fan), I can tell you that the awards are very well-deserved. When I finally get around to my planned "Best of the Audio Books" post, you can be sure this one will be at the top. When you come in to get your own (if you're still not swayed by my fangirling, this gizmo which plays the first chapter should convince you! 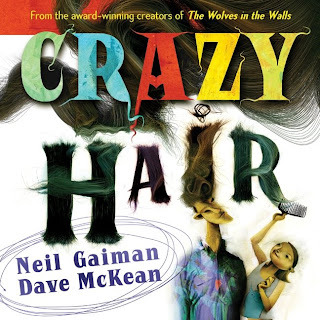 ), don't miss the new Gaiman-McKean collaboration, Crazy Hair. Through the type of amusingly disturbing (dismusing? amurbing?) images and verses only these two can create, Crazy Hair is an odyssey through the narrator's tresses, which have many lives of their own. Disgusting? Well, yes, a little. Delightful? Definitely. The latest Kids' Next Indie Bound list is out! See what our fellow independent booksellers have selected as the best and brightest of the most recent books for all age groups infant to teen. Bloggeratta Rachel, in her alter-ego as an ABC (Association of Booksellers for Children) techie goddess girl, has been preparing for an auction of original art by children's book illustrators. Jerry Pinkney, Kevin Henkes, Steve Jenkins, Brian Selznick, Betsy Levin, and the soon-to-be-signing-here Grace Lin, among many others, have contributed swoontastic art to help make the world a better place for children's booksellers. Our lucky blogger-in-arms will be at Book Expo America in NYC this weekend, hobnobbing with fabulous authors, illustrators, editors, agents, and publishers. Shelftalker is tempting me to brave the four-hour trip on the FungWah bus and and sneak into the event. 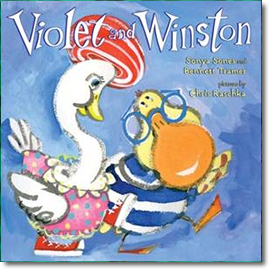 A reminder that THIS SUNDAY, MAY 31, at 12 pm, author SONYA SONES will be here to present her first picture book, Violet and Winston, illustrated by Chris Rashka. Ms. Sones will also be signing her acclaimed YA novels What My Mother Doesn't Know and What My Girlfriend Doesn't Know. NEXT SUNDAY, JUNE 7, at 1 pm, author/illustrator GRACE LIN will present her newest middle-grade novel, Where the Mountain Meets the Moon, and sign a selection of her large body of picture books and novels. Make sure you check our blog or Facebook for details and reminders -- you won't want to miss either of these events! In our continual efforts to expand our internet presence and keep you readers updated in all things Georgian, we have added GoodReads to our Curious George Facebook page! Through either Facebook or GoodReads you can view what the staff here has read and is reading right now. As we go along, we are adding staff picks, reviews and hopefully even genre divisions, for easier perusal. If you haven't friended or become a fan of us over at Facebook, this makes now a good time to do so! This week's picks don't have a particular theme--except that they're both cool! It's amazing what the sun can do, and solar prints are one awesome example! 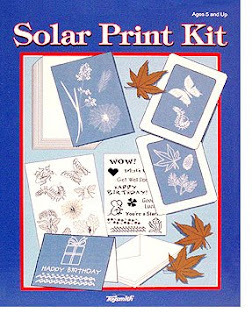 This kit comes with instructions, stencils, and solar print paper that undergoes a chemical change when exposed to the sun, making a silhouette of whatever you place on the paper. It's a fun bit of science, and a great way to make customized cards, signs or wall decorations. Now that the sun is out in full force, it's a great time to try it! 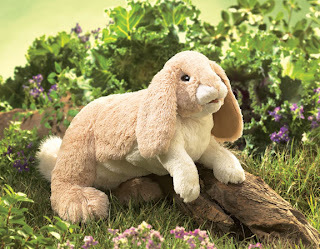 I love this puppet because it looks like my rabbit at home, but also because it's an excellent hugging size (17" long!) and super, super soft. It's got a movable mouth and front legs, expressive eyes, floppy ears and a cute fluffy tail. What more could you want from a bunny? It would also make a great gift paired with a book about a rabbit, whether it's Watership Down for a teen or Busy Bunnies for a toddler. We are pleased to bring you the incredible masterpieces that took the cake in our art and writing contests! Pop on over to our very own contest blog and peruse the stories, poems, essays, paintings and drawings as you like. While you're surfing around on the interwebs, be sure to vote for us as Best Boston Bookstore for Nickelodeon's Parents' Picks! Pretty please! In other exciting news, we have all the latest installments of your favorite series in, so stock up on your summer reading! Rick Riordan's Percy Jackson series wraps up with book number 5, The Last Olympian (or does it?). Michael Scott continues the Secrets of Nicholas Flamel in Sorceress, and D.J. MacHale's Pendragon ends with the tenth volume, Soldiers of Halla. At least there are the prequel books, Travelers: Before the War, to aid in the weaning process there. Now that these series are coming to a close, what new books do you think will take their place as the most sought after adventure tales? When it come s to sought after books, we couldn't leave out the immortal teen vampire and zombie fantasies. Fellow bloggette Katie has written some great posts with suggestions for what next to sink your teeth into, but every week seems to bring in even more! Catherine Jinks puts a spin on the vamp camp with The Reformed Vampire Support Group, about vampires trying to control their urges and assimilate into society even while a suspiciously vampy murder hits the town. Our third bloggette Rachel, has this to say of another new title, The Forest of Hands and Teeth, by Carrie Ryan: "Mary has always lived in the village, where the Sisterhood makes the rules and the Guardians watch the borders. When the Unconsecrated invade, infecting anyone they can catch, Mary must defy what she’s been taught to escape and find the truth. You won’t be able to put this gripping read down!" Of course, we do have plenty more choices than action adventure or vampire romance in our chapter books, so if those genres aren't your cup of tea for summer reading, come see what else we have! Reminiscent of Lewis and Narnia, but set in a more contemporary and nautical place, children are coerced into inhabiting an island to help aging sisters care for mythological sea creatures. It soon becomes clear that the survival of the world depends on how they ensure the survival of these animals. This is my favorite book for sporty girls - because it's about more than a girl going out for her school's football team. 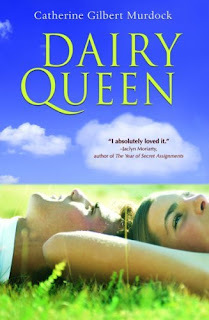 There's rivalry and romance, a complicated family dynamic, a friend with a secret, and a dairy farm to run, too. D.J., a quietly, sarcastic tomboy, is among my all-time favorite characters. 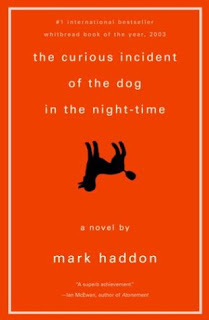 The same traits that make Christopher "different" and "difficult" (like the way he relates better to animals than people, and the way he takes comfort in facts, but hates to be touched) make him the only person who can crack the case when Wellington, his neighbor's poodle, is murdered. 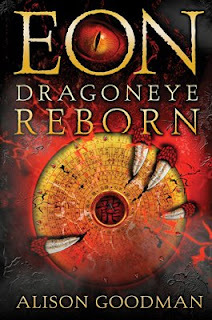 During political upheaval in the Empire, Eon, a Dragoneye apprentice-in-training, revives the long-disappeared Mirror Dragon. But his secret - Eon is really Eona, a girl - threatens everything. Full of action and intrigue, stick with this book's slow start, it will pull you along to its intense, fiery end! To Jack, New York City holds a mythical quality - it's the city where his mother lived, and where she lied eight years ago. When his father sends Jack to see a doctor there, he sees his chance to found out what happened to his mother - with a little help from Euri, a ghost he meets in Grand Central. This week I'm finding myself drawn to small and portable items--just the sort of thing to bring along with you when you're traveling, which I do a lot in May! Nothing alleviates the tedium of a long drive or flight like this nifty thing--cleverly arranged wire loops can be pushed and pulled to make a variety of pleasing shapes, ensuring that your hands will always be occupied. I can't wait to bring one on my travels with me this month to keep me entertained--except for when I'm reading, of course. The fact that these puppets are hand-knitted is not only impressive (I can crochet almost anything, but knitting is beyond my capability) but also gives them character! 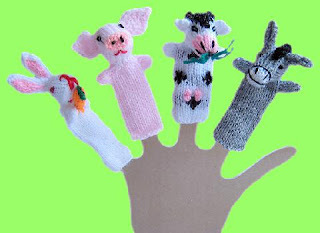 No two are alike, but my favorites are the colorful fish and the giraffe with a super-long neck that's partway stuffed to give it support above the end of your finger. The openings for your finger to go in are of varying size, so there's bound to be one of a perfect fit for every finger! That's it for this week--see you next time! As you can see over on our contest blog, the results of our annual art and writing contests are in! We will have the texts and artwork posted on the contest blog and hung in the store shortly. Winners will receive a congratulatory postcard in the mail. Gift certificates can be picked up in the store. Congratulations, and thanks to everyone who valiantly submitted their work! It's the middle of Children's Book Week, and the Children's Choice Book Awards were announced at last night's Gala! Stephenie Meyer took Author of the Year and Teen Choice for Breaking Dawn (shocker) and Jon Muth the Illustrator of the Year award, for Zen Ties. Mo Willems's Pigeon Wants a Puppy snagged the K-2 grade book of the year, Dinah Williams's Spooky Cemeteries the 3-4 category, and Thirteen by Lauren Myracle the 5-6 category. 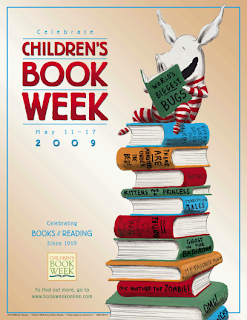 For the rest of the week's events, check out the Children's Book Council website. The week concludes in Boston's own Copley Square at the Boston Public Library and neighboring branches. You can see such authors as Kate Feiffer (Which Puppy? ), Sara Pennypacker (Clementine), Jarrett J. Krosoczka (Punk Farm), and Megan McDonald (Judy Moody). After the event, come on over and check out more books by these talented folks! Not a day goes by here without a person looking about and saying wonderingly, "There's just SO MUCH!" We would love folks to stay for hours, or even better, ask us about something they're looking for, but sometimes a shopper isn't sure what exactly they want, but they'll know it when they see it. To help with these quandaries, we bloggers are compiling themed presents that pair some of our favorite and newest toys and books, as in: "if your four-year-old loves horses, try activity-book-and-game Fun Things to Make and Do Horse and Pony from Priddy Books with Constance McGeorge's picture book, Chestnut." Here are some of our current favorites. For the elementary-school-age puzzle fan, I recommend Spot It! Find the Hidden Creatures written and illustrated by Delphine Chedru or Where Is the Cake Now? written and illustrated by T.T. Khing. Spot It! 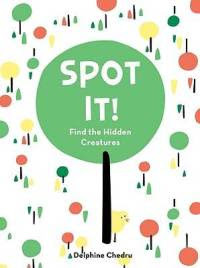 goes beyond your average hidde n picture activity with vibrant illustrations that require a keen eye to discern the creature from the pattern. Where Is the Cake Now? is a wordless book following animal friends on the way to a picnic where the cake mysteriously goes missing! A good observer will enjoy guessing the suspects and following the different characters, a la Richard Scarry. 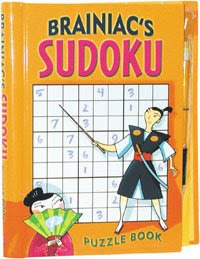 Pair a puzzle picture book with Brainiac's Sudoku from Peter Pauper Press, with strategy tips and puzzle hints and a mechanical pencil with spare leads. 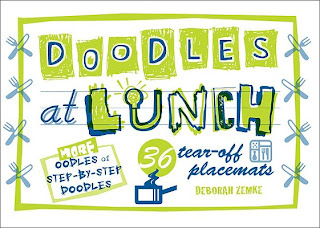 For the artistic child with a sense of humor, try Deborah Zemke's latest in tear-off coloring placemats, Doodles At Lunch. This thick pad has step-by-step instructions for funky doodles like drawing a football quarterback from the letter Q, with plenty of room f or creativity and, well, doodles. Once your artist has conquered lunch, try the Doodles At Dinner book or Taro Gomi Doodles or Scribbles book. Pair a doodle pad with a book of goofy poems, like My Hippo Has the Hiccups, and Other Poems I Totally Made Up by Kenn Nesbit. Poems include "(I'm Always in Parentheses)," "Don't Ever Bite Your Sister," and "My Dog Likes to Disco," which as you may tell from their titles, are unabashedly silly and grea t to read aloud. The thick black spot illustrations by Ethan Long remind me of favorite books and cartoons from childhood. 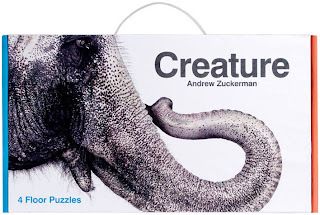 Creature Floor Puzzles, from Andrew Zuckerman's book Creature, are sure to please animal lovers. These giant 16-piece puzzles are 2 square feet of gorgeously detailed portraits of an elephant, ape, lion, and tigers. Those folks over at Chronicle Books sure do make pretty things! 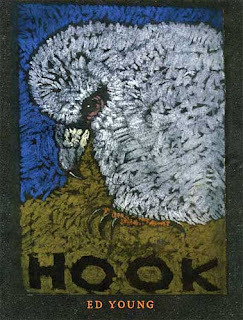 Pair the puzzle with Ed Young's new picture book, Hook, a moving, spare tale of an "ugly chick" that learns to fly. For a more in-depth look at Hook, check out fellow blogger Rachel's other blog, Let(t)'er Rip, in which she writes letters/reviews to authors. Does the young girlie-girl in your life have all the tutus and Fancy Nancy bo oks in the world? Try Fancy Nancy's new Perfect Parfait Game, a board game to design delicious ice cream sundaes - complete with cherry on top! This tasty treat pairs nicely with the good luck charm Unicorn Wishes, a unicorn figurine with a stand and booklet. Every fairy girl could use a bit more magic in her life. 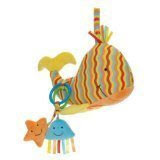 For infants, one of my all-time favorite companies, Jellycat, gives us the Activity Whale: a colorful, be-ribboned whale with jellyfish and starfish crinkler and rattle. The best part? When dropped, it boings. Pair this cuddly marine mammal with Susan Rubin's board book biographies of artists: Magritte's Imagination, Matisse Dance for Joy, or Jacob Lawrence in the City. For the older, stroller lounging set try Sesame Street's Teach Me Elmo, a huggable Elmo in overalls with button, snap, and laces to learn basic dressing skills. Pair the fuzzy monster with Tigger's Giant Lift-the-Flap Book, a flap book to learn colors, numbers, manners, in the style of A.A. Milne and Ernest Shepard. I remember the days when we were just a wee little blog... (Let's face it, we're still a pretty wee blog.) Every week the "three little monkeys" (who were really just Bethany and I!) would agonize over our Friday post: "Should we post about this book? How about this toy? There's that event coming up... Is that enough? Is it too much?" And then we would blog uphill, in the snow, both ways. We've been nominated as Nickelodeon "Parents' Pick" Best Boston Bookstore! Woohoo! Please vote for us online before July 15th. ...and as soon as it's all done, we'll be posting the winning entries on the blog, alerting the winners through the mail, and generally making a well-deserved big fuss over them and their awesomeness. Since lots of you have asked when the winners will be announced, I know everyone's impatient to just know who won already! (Believe me, I am too!) In the meantime, I wanted to link to this incredible art show happening now in San Francisco, called Beyond the Page: Re-Illustrating Our Favorite Children's Books. Our art contest participants have done essentially the same thing these artists have done by illustrating a scene from their favorite story. Maybe someday you'll see a grown-up CG contest winner's work displayed at Gallery 1988! Who doesn't love Jon Scieszka? And really, who can not belly-laugh at the image of Jon Scieszka reading his essay "Crossing Swords" (about sharing a bathroom with his five brothers) to President Bush and First Lady Laura Bush, the Library of Congress, and members of the Cabinet? One of my favorite illustrators, Julie Vivas has, in addition to "safer" subjects like farm animals and grannies, depicted home birth, Alzheimer's disease, children in a concentration camp, and reincarnation, all in warm, fuzzy pastel watercolor. The gentle shapes and colors of her art seems to make these "off-limits" topics more approachable. You can imagine how happy I was to see a discussion of when and how to depict taboos in picture book illustrations broached by the writers and artists over at Blue Rose Girls. What do you think -- at what age do you draw the line (no pun intended) for certain topics? Are there things that are never okay to include in a picture book? My fantabulous fellow bloggette Rachel is such the blogging fiend (see above) that she's got her own epistolary review blog, Let(t)'er Rip. It's brilliant, witty (and yes, occasionally bizarre), so you can see why I love it! Let(t)'er Rip is not entirely children's book reviews, but it's clearly skewed in that direction -- and trust me, you'll enjoy Rachel's thoughtful comments on her lunch break reading whether the intended audience is the board book set or the board room set. Twenty by Jenny is a great new resource for parents, teachers, librarians, and booksellers alike! Children's book publisher and reviewer Jenny Brown has compiled a list of twenty essential books for each of four age groups: birth to 3 (board books), 4 to 7 (picture books), 8 to 12 (chapter books), and teen (YA). That's probably enough bits and/or bobs to exhaust us both for now! It's one of those days where I feel like doing something creative, but not something from scratch--hence this week's crafty kit shopping desires! Though this kit isn't the traditional sort of crafty, it does require a little hand-eye coordination and patience--but the effort certainly pays off! After you've punched holes for stars in these constellation charts and assembled them into a dome, just set the dome on the base and flip the switch, and you've got an awesome star chart projection that could easily double as a nightlight. 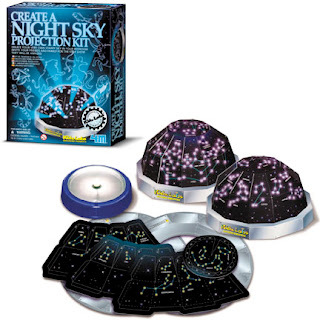 The kit comes with both Northern and Southern Hemisphere star charts, and an especially eager crafter could use the provided paper domes as a pattern to make their own cardboard constellations! 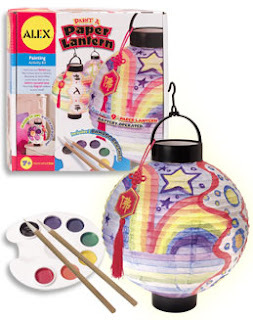 For another creative way to light up a room, try this fantastic kit--it comes with everything you need, including a Chinese calligraphy guide and sumi-e style bamboo brushes to add to the fun. Painting anything three-dimensional is always more fun than just painting paper, and when you're finished, you have a fantastic decoration for a bedroom or desk. That's it for this week--see you next time for another installment of shopping whimsy. They're hot items though, so don't wait long to pick them up! For those of you (poor souls) who haven't yet enjoyed the hilarious ridiculousness that is Audrey's story, here is a little synopsis. Music-obsessed (hmm), sassy Audrey dumps her self-absorbed rocker boyfriend...who, of course, writes a break-up song. A break-up song about Audrey that becomes an instant hit, rocketing the band and Audrey to fame, for better or worse. But even all the free lip gloss and running-from-paparazzi scenes aside, what really shines here are the characters: Audrey and best friend Victoria's banter, the cute awkward co-worker James at the Scooper Dooper, and even Audrey's parents are wonderfully developed. I challenge anyone to read this book and not chuckle out loud on the bus or wish that these teens were real. For now, we'll take the closest we can get, the creator herself. First things first! Can you make us a playlist? What about a reading list? 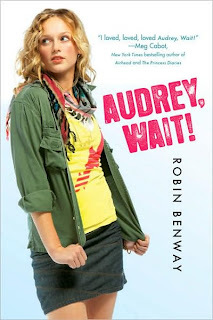 What would you recommend as the next book for a fan of Audrey, Wait! (basically, how would you do our jobs for us)? Ohhhh, geez. Well, I'm super-super-superstitious when it comes to talking about new things. Even my best friend doesn't know what it's about! I can say it's about three sisters, I'm currently editing it right now, and I really really love these girls. I hope everyone else will, too. I know this may be a difficult question, but what brought you to write, and why for teens in particular? No, it's not difficult at all, no worries! I've always loved writing, and I had worked a bunch of different jobs in the publishing industry, but I finally hit a point where I was just unhappy and dissatisfied. I decided I would take a year and start working on a book, even though I had no idea what that book would be about. Then one day, the idea of Audrey, Wait! just slammed into my head and I started writing the first chapter almost immediately. As for writing for teenagers, I had actually applied to MFA programs a year or so before I took a year off to write, and I wrote a short-story from the point of view of an 8-year-old girl for my submission piece. I had always written from an adult POV before, and I was surprised how much I enjoyed writing from a younger perspective. I've also been a huge fan of YA literature and I thought that it'd be a good thing for me to try, and it turned out that I loved it! Were you anything like Audrey when you were a teen? I wish I had had even half of her sass when I was 16! Pretty much, yes. I've always been quick with a sarcastic comeback, which is both good and bad. I think Audrey has way more self-confidence than I ever did, though. She's just fearless even when she's screwing up and making bad decisions. Even to this day, I wish I was as cool as her. A good amount of books are coming out these days with a focus on music, or characters who are obsessed with music, across a range of readers (Nick Hornby’s High Fidelity, David Levithan and Rachel Cohn’s Nick and Norah’s Infinite Playlist, for example.) What do you think this says about our culture and the way people read? Where do you think Audrey, Wait! fits in? I think Audrey is definitely a music-based book, and I think that the current influx of music-themed novels just goes to show how well different artistic forms can blend together. I constantly listen to music when I write and I can't imagine doing one without the other, and it's become clear that a lot of readers and writers feel the same way. There's also this intangible feeling that happens when you hear a song that you think is perfect, and if you can have that experience while reading a book that you love, it becomes magical. Music inspires me every single day and I love the idea that we can all draw so much inspiration from so many artistic sources. What would you confess (or rant about) on MTV? I would confess absolutely nothing on camera and instead I would demand to know why the show Parental Control exists. Have you seen it? It's this show where the most obnoxious people date each other, and then the parents step in and try to set up dates for their kids to replace the loser boyfriend/girlfriend. It's terrible, and I know this must mean that I'm getting old, but I'm okay with that. And if they hadn't pulled me off-camera yet, I would ask why Los Angeles drivers cannot understand what the green left-hand-turn arrow means. And then I would pull an Audrey and say hi to my grandma and leave. Where would you take Curious George if the man in the yellow hat needed a babysitter? I love this question so much! Well, first I'd make sure that George was cool with hanging out in LA for the day, and then I'd take him to meet my friend's 4-year-old son. He'd be so psyched to meet his favorite book character! Then we'd go to lunch at the Fairfax Farmer's Market, since I'm pretty sure that George would love it there. So many things to see! So much trouble to get into! I'd just make sure to keep him away from the store that sells hundreds of different kinds of hot sauce. Then we'd hang out for a while and then head towards the beach so he could see the ocean. Maybe he'd like the Santa Monica Pier. I'm pretty sure he'd be down with all the seagulls there, too. Finally, we'd go to Topanga Canyon since it's my favorite spot in Los Angeles and I think George would enjoy all the trees and grass. And finally, at the end of our day, I would ask George very very nicely if he would please tell me the man in the yellow hat's real name. Thanks again to Robin Benway for talking to us! For more of her total awesomeness, head over to her blog or the Audrey Wait! website (be sure to try the Tabloid Generator). So many adorable and affordable new goodies have come in recently that I figured it was about time for another frugal round-up! In case you missed the first transmission, this feature highlights quality, budget-friendly toys for all those little occasions you want to bring a little something but not empty the piggy-bank on. Battat's Sturdy Work Trucks are perfect for construction-loving toddlers, with moving parts and Playmobil-style little workers. You can choose from a cement mixer, garbage truck, fire engine, dump truck, or the ever popular front end loader. Shopping for a newborn? Supplement the classic gift of Margaret Wise Brown's Goodnight Moon with Goodnight Moon alphabet blocks from Peaceable Kingdom. The blocks picture upper and lowercase letters and items from the book, with my personal favorite, a bowl full of mush. I love all things Lew is Carroll, so of course my heart pitter-pattered over Alice In Wonderland note cards and envelopes from potter style. This collection of vintage style prints comes bound in a "book" with a magnetic clasp (swoon). As if my pen pals needed more Alice paraphernalia in their mailboxes. We also carry the Alice and Wizard of Oz jigsaw puzzles from potter style. Down in our chapter book room, challenge your friends, family or just yourself with the quick-to-learn puzzle game Set. 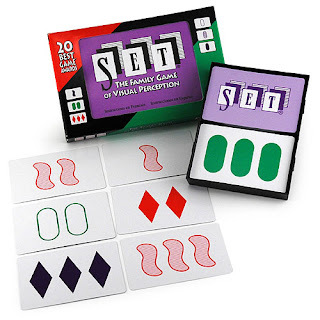 Each card has four characteristics - color, shading, symbol, and number - and a set is three cards with either all matching or all conflicting features. You can give it a try at Set's Daily Puzzle page. 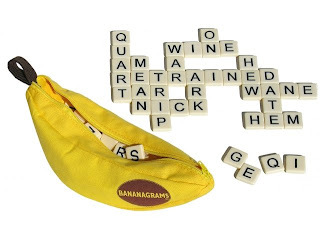 Another popular game downstairs is Bananagrams, which yes, is actually a cloth banana full of letter tiles. The appeal of this crossword game is that each person makes their own board, with the object of the game to use all of the letters in the "bunch." ...Perhaps you could sing along to Raffi's Bananaphone while you play? Hands down, the best toy in this category is the Blooming Flower Wand (or as staffer Bethany terms it, the Tulip Scepter) from Jeannie's, a flower wand with a dignified, not excessive, amount of ribbon and sparkle, perfect with fairy wings and a tutu. 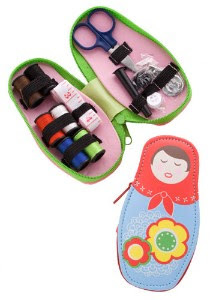 For crafters, menders, or fans of tiny cute things, Cupcakes and Cartwheels offers us the Russian Doll Sewing Kit, a pocket-sized kit in the shape of a matroshka doll, with all of the necessary tidbits of sewing, including scissors, measuring tape, a handful of spools of thread and a tube of needles. Fans of tiny cute things might also love, as we certainly do, Two's company's Kimono Fish Coin Purses. These adorable, big-eyed fish come in a variety of colors and "kimono-style" fabrics. (I have a feeling this may turn up Rachel's weekly "What I Want" series, another place to discover some of our treasures). 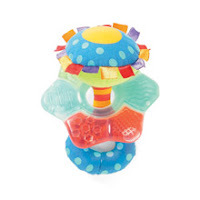 Manhattan Toy's chic is epitomized in the Wobbles Water Teether, a colorful, multi-patterned, ribboned and textured rattler-and-teether-in-one. All this fun, and perfectly sized for infant clutches! For the budding naturalist (that pun wasn't even intentional), toy giants Melissa & Doug bring us a new brand of gardening tools: Sunny Patch. My favorites are the big, safe, and easily gripped Mombo Snake and Blossom Bright Magnifying Glasses, perfect for sleuthing and staring at bugs (which you can learn about in a variety of books, especially Dirty Rotten Bugs and DK's Big Book of Bugs). Just look at the snake's head handle, too cool! If our Molly & Me jewelry selection isn't enough for your young accesorizer, try Two's Company's new Charm Candy Charm Bracelets. These faux-silver bracelets can be adorned with cute charms ranging from butterflies, cupcakes and "sweet 16" to cell phones, miniature purses, and a little black dress (!). 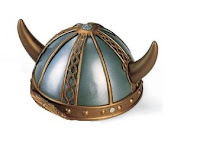 This Small World Toys' Viking Helmet brings to mind fond memories of my college roommate one silly Halloween. 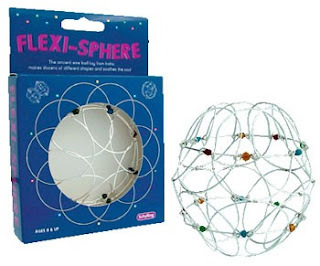 What child or adult could not enjoy hours of imaginative play/roommate or co-worker amusement with this fun accessory? For those of you who prefer more practical uses to your toys, try Toysmith's Animal Rubber Bands. These colorful farm or zoo themed rubber ba nds add pizzazz to any project. 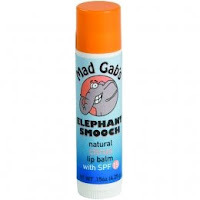 Mad Gab's Lip Balm are tasty and stylish little gifts for pouters of any age. Flavors include Vanilla Shark Smooch, Spearmint Monkey Smooch, and Citrus Penguin Smooch, variety enough to tempt palates of all tastes. 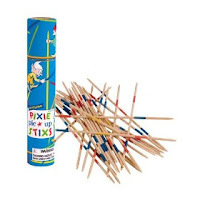 No game room or college dorm is complete without the classic game of pick up sticks. Try Schylling's Pixie Pic Up Stixs, stored in a convenient blue, pixie-decorated tube. 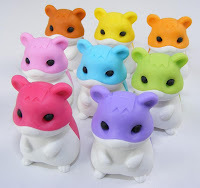 Last, but certainly not least, the toy that everyone has been asking for: Japanese Erasers! Collect all the colors of the cute hamster, make a picnic with the tiny cakes and burgers, or stage Richard Scarry's Cars and Trucks and Things That Go with the little fire engines and motorcycles. Or, you know, just erase mistakes with an especially cute eraser.